Vancouver City Council passed a motion in 2011 designating Black History Month as a civic special event. Here is how they describe it – note the references to religion; more on Nora Hendrix and her grandson Jimi, and their church, below. Black History Month is an opportunity to share the history, contributions and culture of Black Canadians. Around 1900, the Black community from Vancouver Island moved to the Lower Mainland and settled in Vancouver’s Strathcona neighbourhood, also known as Hogan’s Alley. Hogan’s Alley ran between Union and Prior streets from the alley east of Main Street to Jackson Street. 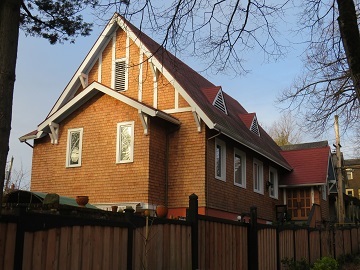 Charles and Nancy Alexander initiated the Shady Creek Methodist Church [in Saanichton]. Mayor Kennedy Stewart and Vancouver City Council will proclaim February as Black History Month February 1, 6 – 8 pm at City Hall. 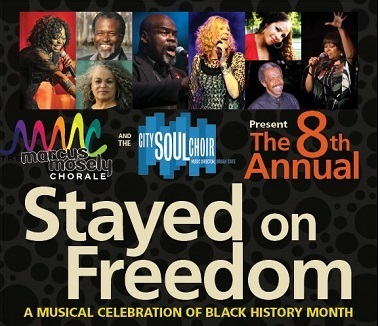 Christ Church Cathedral will start things off with a bang by hosting Stayed on Freedom: A Musical Celebration of Black History Month this Saturday (February 2). The annual event is usually held at St. Andrew’s-Wesley United Church, but it is closing this weekend for two years worth of major renovations (see my ‘Around Town’ column this week). Marcus Mosely (artistic director of The Marcus Mosely Chorale), in remembering his youth while growing up in the Black community of Texas, has selected the theme of ‘Homecoming’ for this concert. Marcus recalls that – generally in the summer – family, friends and members of the community who had moved away would return home for faith, food and family reunions. He remembers picnics, baseball games, house-to-house visits, and always, always, at least one big church service with preaching and lots and lots of music. It is this kind of love, energy and celebration that this year’s ‘Stayed on Freedom!’ concert plans to rekindle. When Marcus came to Vancouver in 1985, a community of Black entertainers took him in; he affectionately called this community the “Black Pack.” Like Marcus, most were expatriates who were missing their homes and their culture. From the times they spent together, the “Circle of Voices” was born. We are honoured to welcome many of the “Black Pack/Circle of Voices” to this year’s show: Candus Churchill, Sybil Thrasher, Will Sanders, Joe Chappel and Dalannah Gail Bowen. Adding some spice to the show will be Ndidi Cascade – a local hip hop artist and educator, and Leora Cashe – a well-loved Vancouver jazz, blues and gospel singer. This year marks the 100th anniversary of a church which was central to the Black community in Vancouver for decades. That history will be marked by the Grand Re-opening and Celebration of African Fountain Chapel Vancouver (AME) February 24. Nora Hendrix, Jimi’s grandmother and a stalwart of Fountain Chapel, was featured on this stamp. 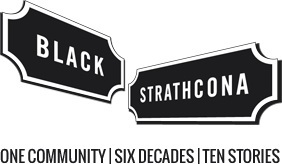 The presence of people of African descent in the Strathcona area of Vancouver has a history that dates to the early 1900s. In 1918, the African descent people all came together to raise money purchase this church through a matching fund from the African Methodist Episcopal Church of America. The African Methodist Episcopal (AME) Fountain Chapel at 823 Jackson Avenue signalled the formation of a well-organized black community. The church was the product of fundraising efforts initiated by prominent members of this growing community such as Nora Hendrix, who was honoured on the Black History Month Canada Post stamp in 2014. Recognized as a heritage site by the Vancouver Heritage Commission . . . Fountain Chapel is . . . located at Jackson and Prior Street in the Strathcona neighbourhood . . .
Hogan’s Alley [the unofficial name for an alley that ran between Union and Prior Streets from approximately Main Street to Jackson Avenue] has come to represent much more than a physical neighborhood that once stood in Vancouver. The history and culture surrounding the past and present Hogan’s Alley parallels the larger plight of Black Canadians. 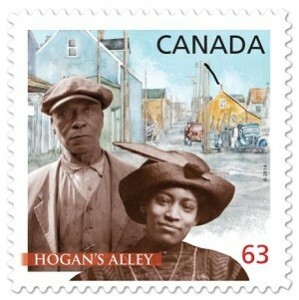 Today, Hogan’s Alley embodies a multitude of issues surrounding equality and civil rights for all citizens of Vancouver but in particular, those of the Black community who have suffered the destruction of their homes and businesses and are today seeking the opportunity to reestablish a sense of place that is so vital to the identity and cohesiveness of their community. They do not aspire to reconstruct in physical form the neighbourhood that was destroyed, but rather a development framework that is inclusive of all Vancouver’s citizens and will support opportunities for historically marginalized and disenfranchised peoples to build for themselves a better future. Fountain Chapel now meets at 525 Campbell Avenue, on the grounds of Sacred Heart Catholic Church, under the leadership of pastor Andrew Mutuma. However, the church’s history had been interrupted. The original home of Fountain Chapel, at Prior and Jackson, now no longer used as a church. 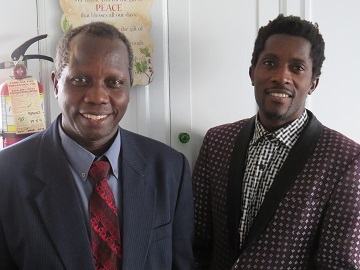 Pastor Andrew Mutuma of Fountain Chapel and Yasin Kiraga Misago of the African Descent Society. I wrote about this church as one of Vancouver’s lost churches four years ago, without knowing its full history. The February 24 celebration of African Fountain Chapel (AME) will take place from 11 am – 4:30 pm at 887 Keefer Street and will feature an address by American civil rights lawyer Julialynne Walker. Other guest speakers will be Hon. Jean Augustine and Vancouver city councillors Rebecca Bligh and Michael Wiebe. The day is sponsored by the church and the African Descent Society BC. For a list of several other Black History Month events go here.